Pet costumes are nothing new, but this year, more than ever, dogs dressed as "Star Wars" characters from this past Halloween went viral. For example, had the quite memorable, much e-mailed sight of Bones, an Italian greyhound dressed as an AT-AT from "The Empire Strikes Back," and the significantly more obvious Ewok costumes from "Return of the Jedi." (And then there are the nursery decorations, but I digress). 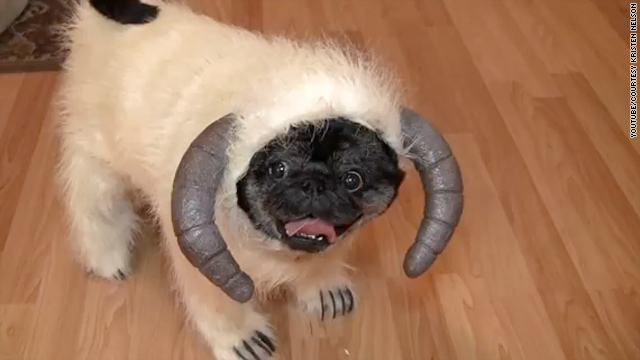 The aforementioned AT-AT costume went viral before Halloween, and one video in particular, introducing the "Wampug" (a pug named Chubbs, dressed as a Wampa – the creature who attacks Luke Skywalker in "Empire") has attracted nearly 300,000 views on YouTube since the start of November. There's nothing like seeing this dog scampering around, ready for a trip to the ice planet Hoth. CNN Geek Out: Where did you come up with your canine costumes? Mello: From the first time we saw Bones, my husband and I thought he looked like an AT-AT. Narrow body, long, skinny legs, he was the perfect form. I have been wanting to make this costume for about 3 years now. 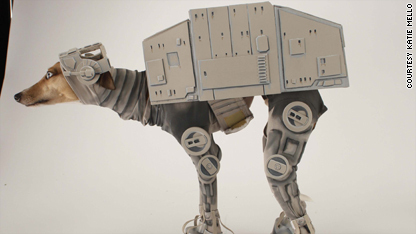 Andrews: My husband and I are big fans of the "Star Wars" franchise and initially planned to make Chubbs an AT-AT Snow Walker costume from "The Empire Strikes Back," but at the last minute changed our mind when someone else [Mello] created an amazing AT-AT costume for their greyhound. When we found white fun fur at the craft store, we were immediately inspired to create a Hoth Wampa costume, but it was a last minute decision. CNN Geek Out: How long have you been a "Star Wars" fan? Mello: "Star Wars" was definitely my favorite movie growing up. I can remember one Christmas we got a Beta tape player, "Star Wars," and "Empire Strikes Back" on tape. I don't think that "Jedi" was available yet. I watched those first two movies a lot. When I was younger I wanted to work for Industrial Light and Magic when I grew up, to make movies like "Star Wars." I studied everything I could about making special effects. By the time I entered the business, most of the fun stuff was being done on computers. Andrews: [I've been a fan] ever since I saw the movie in the theater with my family when I was six years old. I can remember seeing Darth Vader on the screen for the first time, watching in amazement at the lightsaber fight, holding my breath as Luke and Leia swung to safety-escaping the Stormtroopers, and cheering as Han came to help luke at the last minute to blow up the Death Star, while wondering what happened to Darth Vader as he spun off into space. CNN Geek Out: Have you done these sort of costumes more than once? If so, what other costumes have you done? Andrews: Yes, Chubbs has had quite a few costumes over the years. She was featured as the mascot for my veterinary hospital’s website-Stockton Hill Animal Hospital and had a different, store-bought costume each month for several years. About four years ago, my husband and I decided to put our own costume making skills to use and create more unique, one of a kind costumes for Chubbs. The first costume was Chubbs as a checkerboard, then as a mini Cujo (from the Stephen King story). The following year we made her a "Skele-pug" and last year she was "Freddy Pueger" (from "Nightmare on Elm Street"). Mello: I make stop motion puppets for a living, mostly for TV commercials, at Laika Studio. While doing that I have developed the skills to make just about anything I can think of. I have tried my hand at a lot of different things, but this is my first costume. CNN Geek Out: What kind of response have you received? Andrews: The response have been overwhelmingly positive. I never expected this to happen since the video was just a quick impromptu clip. There have been a few people who have expressed concern because they mistakenly think Chubbs can’t breathe because she is overheating or that dressing her up is mistreating her. While those can be concerns when dressing a pet in a costume, I have allayed many people's fears by letting them know that I am not only Chubbs' mom, but I’m also her veterinarian! We pay very close attention to Chubbs when she is in costume to make sure she doesn’t overheat. Those who have never spent a lot of time around pugs are often surprised by how loud their breathing is, especially when they are excited, and when she is in costume she knows she is being shown off and loves the attention so she gets very excited to strut her stuff! Mello: Mostly people love it. It makes them smile. Bones has over 7000 friends on his face book page, "Bones Mello the AT-AT dog". The negative response is pretty interesting. A lot of people are upset because he is so skinny. He is an Italian Greyhound. That is just how he looks. I think it is hard to tell, but he is really quite small overall, he only weighs 11 pounds. He is very healthy and gets plenty to eat. The other complaint is that people say, "ooh, that dog must really hate his owner." Everyone that knows Bones laughs at those remarks. He is spoiled, he gets to go to work with me almost every day. He is full of love and is happy to do silly things like get dressed up if it gets him attention. Oh, and people assume that a man made it. I think that is really interesting. Nope, a woman made it. CNN Geek Out: Do you plan to do this again next year? Any thoughts on what you would do if so? Andrews: Absolutely, this is a yearly event for Chubbs! Everyone looks forward to seeing what we come up with. We already have a number of ideas, but I think it will be pretty hard to top the Wampug. A few of them are "Star Wars" characters, but there are a few non-"Star Wars" ideas as well like the brain bug from "Starship Troopers" and a Teenage Mutant Ninja Turtle. Mello: Yes, I have some plans... You will just have to wait and see. CNN Geek Out: Have you been in touch with others who have dressed their pets up as "Star Wars" characters or creatures? Mello: I have not. There is a great video of a Wampug that I just saw and love. I have also seen some great Chewbaccas. Someone needs to have a dog costume convention! That would be pretty fun. Maybe as a part of one of the big comic cons. Andrews: We know a couple of friends who have done so, but I think we are the only ones to do so on a yearly basis. Most of our friends spend so much time building their own costumes that they don’t have time to make one for their pets too! Thanks a lot for giving everyone an extraordinarily remarkable possiblity to read from this website. It is often very pleasurable and as well , jam-packed with a good time for me personally and my office fellow workers to visit your blog at least 3 times in one week to find out the new items you will have. And indeed, I'm so certainly fascinated considering the fabulous ideas you serve. Selected two areas in this post are undoubtedly the most impressive we have had.